Essential English Language examination higher studies, work or migration purposes in UK, Australia, New Zealand, Canada, USA. etc. Latest IELTS material from UK Guaranteed results Best Lecturers from Sri Lanka Convenient Location. 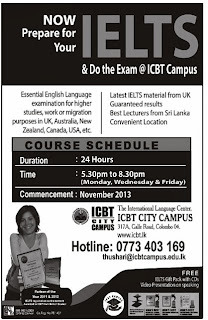 Call Hotline 0773403169 or click bellow image for more information's.